How do you say Quinoa? After reading the entire blog post and checking out the recipe, I knew I wanted to make it too, with one small edit. The original recipe calls for olives and I’m sure their acidity worked great with the dish but Eric and I don’t really enjoy olives so I threw some deep green kale into my dish. The kale added a little bitterness and even more color to an already beautiful dish and kicked up the healthy quotient another notch. This recipe includes butternut squash, quinoa (a whole grain I had never used before and couldn’t pronounce), tomatoes, chicken and kale; all I see are vitamins! Quinoa ( /ˈkiːnwɑː/ or /kɨˈnoʊ.ə/, Spanish: quinua, from Quechua: kinwa), a species of goosefoot(Chenopodium), is a grain-like crop grown primarily for its edible seeds. It is a pseudocereal rather than a truecereal, or grain, as it is not a member of the grass family. As a chenopod, quinoa is closely related to species such as beets, spinach, and tumbleweeds. The tumbleweeds part was a little weird but I did get the pronunciation and have been saying keen-wah ever since. After my vocabulary lesson, I went to the grocery store and picked up all my ingredients including quinoa, which I found in the organic section. I did decide to use my homemade chicken stock in the recipe because my freezer is filled with it but I know that boxed chicken stock would work just fine. Start the stew recipe by peeling and slicing up the butternut squash, making sure to scoop out the seeds. Steam all the squash for about 10 minutes. Remove half of the squash from the pot and place in a small bowl off to the side. Continue steaming the remaining half of the squash for about 6 minutes so that it is soft enough to mash. While the rest of the squash is steaming, bring the chicken stock to boil, in a separate pot, put in the chicken thighs and cover. Cook for about 15 minutes until the chicken is cooked through. Remove the chicken thighs and cover to keep warm. Once the squash is steamed, move it from the pot to a bowl and mash. Be sure to keep the first squash pieces separate and whole. In a large pot or dutch oven, heat the oil over medium heat and cook the onion until it starts to brown. Add in the garlic and oregano and cook for another minute. Add in the tomatoes and butternut squash both mashed and the larger pieces. Stir well. Add the chicken stock and quinoa. Bring to a simmer and cook for about 15 minutes until the quinoa is translucent. While the quinoa is cooking, shred the chicken with a fork or your fingers. Add the chicken and chopped kale once the quinoa is cooked. Add salt and pepper to taste. Finally stir in the fresh flat leaf parsley. Serve with a slice of crusty bread and feel your body say thank you for all the healthy ingredients! I loved this dish, it will become a staple in our Winter meal rotation. It makes alot too, which is perfect for a week’s worth of homemade lunches! The flavors really are right on and the quinoa was a nice consistency, lighter than I expected (much lighter than pasta) and added great texture. Transfer the chicken thighs to a plate and allow to cool. Pour broth into a medium-sized bowl. Return the saucepan to the stovetop and lower heat to medium. Add olive oil. Add onion and cook, stirring occasionally, until onion is starting to turn brown, 8 to 10 minutes. Add minced garlic and oregano. Cook, stirring, for 1 additional minute. To the saucepan, add tomatoes, butternut squash pieces, mashed butternut squash. Stir to combine. Stir in reserved chicken broth and quinoa. Bring to a simmer, cover and cook until the quinoa turns translucent, about 15 minutes. Shred the chicken with your fingers or a fork. Stir the chicken, olives and pepper into the stew and simmer, uncovered, to heat, about 5 minutes. The other day I went to the seafood store (Mr. Bill’s if you live in Lancaster, its the best seafood around) with the intention of picking up salmon for dinner. After walking in, I eyed the much more expensive scallops sitting in the case and heard myself asking for a pound of scallops instead of salmon. I tend to think more with my stomach sometimes than with my head. Scallops are my favorite seafood. I’ve loved them since I was a kid and have eaten them so many different ways, falling deeper in love with the little mollusks eat time. It’s hard for me to resist good looking scallops and this day was no exception. Upon returning home, I took inventory and realized that I had all the ingredients for the salmon dish I had intended to make and nothing for scallops. It was time to start researching a new scallop recipe. I had jasmine rice, shallots, mushrooms and broccolini. 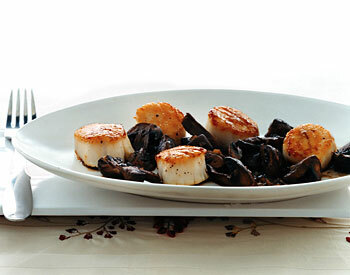 I logged onto Epicurious.com and found a recipe that included scallops and mushrooms in a sherry sauce. I did have sherry in the pantry and upon reviewing the needed ingredients, discovered I had everything else needed. I also notice the recipe used soy sauce and immediately thought that I could serve the dish easily with the jasmine rice I already had waiting to be used. I have never paired scallops with mushrooms or soy sauce before and was excited to taste the combination of flavors. The recipe itself was simple and I made the whole thing in about an hour, including the time it took to cook the rice. Except for being expensive ingredients, this can easily be prepared on a weeknight. Start the dish by searing the scallops in a hot pan with heated oil. Scallops cook quickly and the second side takes less time than the first. I cooked them for about 3 minutes per side but next time will only cook them for 2 minutes after I turn them, they were just a little dark on that side for my taste. Once the scallops are cooked, remove them from the pan and place on a plate covered with foil to keep them warm. Melt butter in the same pan and saute the mushrooms until they begin to brown. Add the garlic and shallots and cook for about 2 minutes. Add sherry, soy sauce, balsamic vinegar and salt and pepper and simmer uncovered until it begins to reduce. Then take the pan off the heat and stir in the butter. Place the scallops into a deep bowl or dish and pour the mushrooms and sauce over top of the scallops. Serve with a side of rice and a pretty green vegetable, in my case brocolini. The flavors were great and I liked that the sauce wasn’t cream based, some scallop recipes have very rich and heavy cream based sauces but this was a nice change. Plus, the mushrooms were a delicious pairing with the scallops. Pat scallops dry and sprinkle with pepper and 1/4 teaspoon salt. Heat oil in a 12-inch heavy skillet over moderately high heat until hot but not smoking, then cook scallops, turning over once, until browned well and just cooked through, 5 to 7 minutes total. Transfer to a platter and loosely cover. Heat 2 tablespoons butter in skillet over moderately high heat until foam subsides, then sauté mushrooms, stirring occasionally, until golden, about 4 minutes. Add shallots and garlic and sauté, stirring, 2 minutes. Add Sherry, vinegar, soy sauce, and remaining 1/4 teaspoon salt and simmer, uncovered, stirring occasionally, 2 minutes. Cut remaining 2 tablespoons butter into small pieces. Remove skillet from heat and stir in butter until incorporated. Spoon sauce over scallops. I hope that everyone has recovered from their turkey comas and the lack of sleep from Black Friday shopping and is as disappointed as I am to be heading back to work on this Monday morning after Thanksgiving. Why does the Thanksgiving holiday always go by so fast? We spent a wonderful day with family and ate a delicious turkey dinner, on Thursday. Then we spent the following three days getting ready for Christmas. Friday, we went out and cut down our own Christmas tree (at Frog Hollow Evergreens for those in the Lancaster area, all trees are $35 no matter the size!). Eric got it into the stand promptly and got to work at putting on the lights. He takes the lights very seriously and put a total of 9 strings onto our tree this year totaling about 1400 twinkle lights on our tree, it looks kind of amazing. That picture doesn’t do it justice, but here is one with flash so you can get a better idea. Notice our brand new Eiffel Tower tree topper; I was pretty psyched when I found that! While Eric was immersed in his lighting task, I got out the rest of the decorations and began making the rest of the house look festive. Everyone has their favorite holiday decorations and these are a few of mine. Each year I decorate the fireplace mantel a little differently. Last year, I used alot of fresh white pine garland but this year wanted to go for less of the garland and more of the glitz. I filled glass vases with gold and silver metallic balls. I picked up three mercury glass votives from Target and arranged when with some of the tree trimmings in the center of the mantel. Then I clumped together glass candlesticks and a green and clear glass vase that was given to me. Combine all these and you get our Christmas mantel. I also made another small arrangement with things I already had around the house on the piano, filling the vases with mixed nuts and fresh cranberries I picked up at the grocery store. The last small touch I added was a glass bowl filled with more ornaments in metallic red and silver, its amazing how pretty something so simple can look on the dining room table. We haven’t done anything outside for decorations yet, but I’m planning some wreaths as well as a filling my window box with greenery. More to come on that next week. Did you spend any time decking the halls this weekend like we did? Do you like to work with what you have, or are you planning something more elaborate that requires a few new purchases? Have a great holiday decorating idea that you’d like to share? I hope in between reading the blog today you get a chance to score some sweet Cyber Monday deals. It might even help cushion the blow of being back at work…maybe. Have you been invited to Thanksgiving or just to a gathering of friends and asked to bring an appetizer? Are you completely blank on what to make? I feel your pain. Appetizers are not something that I make often, I enjoy ordering them in restaurants, but when it comes to making them in my own home, I typically move right on to the main meal, skipping appetizers all together. A few years ago, I was asked to bring an appetizer to Thanksgiving and had no clue what to make. I needed to feed a lot of people and I wanted something that wasn’t very complicated. I came upon a recipe for spinach artichoke dip and immediately knew I needed to make it. Everyone loved it and it became one of my go-to appetizer recipes. I made some last week to take to a party and was able to make most of it the night before and finish it off when we arrived at the party. It’s a perfect take-along dish! Start the recipe by thawing your spinach and wringing it out between paper towels. Then chop up the onions and drain and chop the canned artichoke hearts. Mince the garlic and grate the lemon peel. Melt the butter in a saute pan over medium heat and then add the onion and garlic. Cook for about 5 minutes. Add in the thyme and lemon peel and stir. Add the flour and whisk well and cook for 1 minute. Add the chicken stock, whisking the whole time and salt and pepper. Increase the heat to high whisking often and cook until it gets thick 8-10 minutes. Stir in the artichokes and spinach and half of each of the cheeses. Transfer the mixture to a casserole. At this point, I put my dip in the refrigerator overnight. When you are ready to re-heat the dish, put it in a 350 degree oven for about 20 minutes until its heated through. Sprinkle the top of the dip with the rest of both cheeses and put under the broiler for 5 minutes until the cheese is melted and begins to brown. Serve with French bread slices, Melba toasts, crackers or corn chips. In a microwaveable bowl, defrost the spinach in the microwave for 6 to 8 minutes. Drain the spinach in a kitchen towel and wring dry. Tear the spinach into small pieces and set aside. In a medium skillet, melt the butter over medium heat. Add the garlic and onion and cook until tender, about 5 minutes. Stir in the thyme and lemon peel. Whisk in the flour and cook for 1 minute. Gradually whisk in the chicken broth and season with salt and pepper. Increase the heat to high and cook, whisking often, until thickened, 6 to 8 minutes. Stir in the spinach, artichokes and half each of the Parmigiano-Reggiano and the mozzarella. Transfer the mixture to a casserole. Refrigerate overnight if making ahead. Re-heat dish at 350 degrees for 10 minutes until heated through, when ready to serve. Preheat the broiler. Broil the dip until bubbly and lightly browned, about 3 minutes. Serve with the bread cubes. I can’t believe I’ve made it; its finally Thanksgiving week! Three more days at the office well, less than that since today has already begun, and we’ll all be enjoying some delicious food along with friends and family. This will all be followed by the “official” beginning of the Christmas season and all the wonderful food and fun that goes along with it. Can you tell that I can’t wait?! But, before all that happens I’d like to impart any small shred of wisdom I may possess to help you have a wonderful Thanksgiving. If you’re like me, you go to someone else’s house for Turkey Day but are planning to bring a dish/dessert/wine or something else they’ve asked you to bring. As a good guest, even if you’re not asked to bring anything, it is always best practice never to show up empty handed. If you know that you’re host enjoys wine, a decent bottle is always appreciated and its an easy option since you don’t have to slave away in the kitchen attempting to impress them the entire night before. These days you really can get a good wine at a very reasonable price so don’t think you need to spend $50 or more to impress. Keep everything in perspective; the average bottle of wine produces 4 glasses, why would you spent lots of money on a bottle of something that will be gone in no time? Just aim to get something that many people might enjoy and that pairs well with the turkey. When considering what type of wine to buy, most people think “turkey, white meat, I should get a white wine.” This is a good thought and a great place to start. I am by no means a wine expert, far from it but I find that articles detailing particular bottles of wine are too intense for me. I go into the liquor store thinking on more broad terms and I’m starting to understand how different varieties pair better with different meals. So, if you’re going with a white wine I suggest something crisp and dry. Look for a pinot grigio or a chardonnay. **Tip: the “kind” of wine refers to the actual grape they use to make it. So pinot grigio refers to pinot grigio grapes! ** (I didn’t know this until last year; sorry if you’re thinking “well, duh!”) Always remember to chill a white wine before drinking it, too. You can find these in the domestic section of the liquor store, more specifically from California. Maybe, you prefer red wine (I sure do!) and you think that red is a bad choice because of the turkey meat. Don’t worry, there are reds that go with turkey. I recommend a pinot noir. You can find these at very low prices, these days, some even with a screw top. You can find these in the California section at the liquor store and in the French section. The other red I recommend is a Beaujolais. You’ll find this in the French section and they have a smooth complexity, like any French wine, but it pairs very nicely with the Thanksgiving menu. Maybe, you were hoping for a rose. This is also a great choice for Thanksgiving (NOT A ZINFINDEL!). 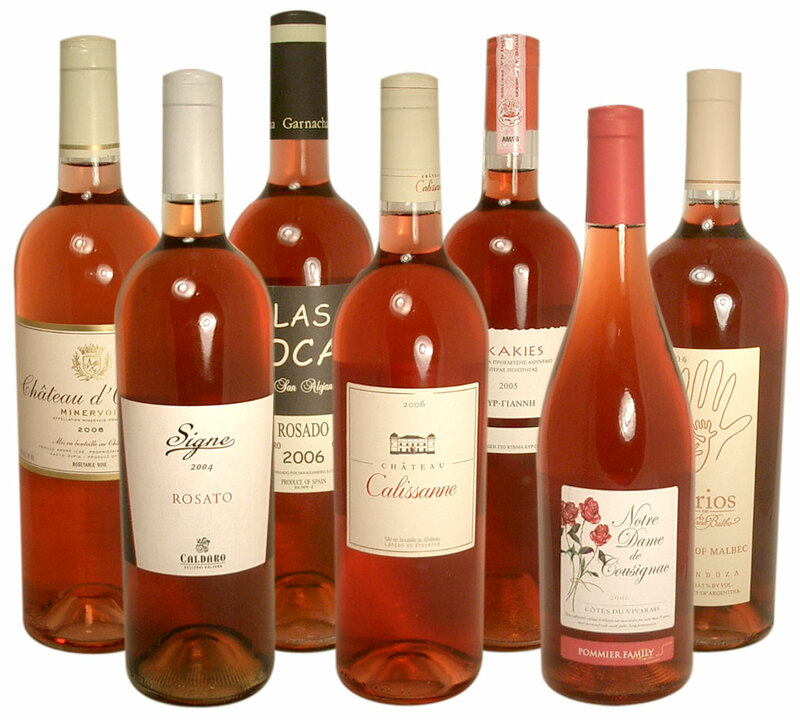 A French rose will be dry enough to pair well with the turkey. The last choice I’ll give you is champagne. It is a holiday, after all and champagne pairs beautifully with the Thanksgiving flavors. Plus, your host will think you’re pretty awesome for bringing something special to their gathering. A prosecco will also work here if you prefer that to champagne. My biggest piece of advice when it comes to choosing any wine is to start reading the label. Most labels will have a short description on the back of the bottle detailing the flavors the wine contains such as blackberry, cherry, currant or coffee. If you’re shopping for Thanksgiving, look for berry flavors. Just as cranberry sauce goes with turkey and stuffing, so will a wine that has berry flavors. Not all wine will have a description on the back, but alot will and I for one, never buy bottles that don’t have one; I’m not fond of those kind of surprises. The other “best practice” is to ask the people who work at the liquor store for help. Tell them what you’re buying for and what price you’d like to stay at, often they know of special sales running and can help you choose a wine that not only goes well with dinner but is on sale and saves you a few bucks. Don’t let buying wine intimidate you, the only way to learn is to ask. Tomorrow, I’ll share with you a delicious and easy appetizer recipe for you to bring to Thanksgiving! Last night I made mashed potatoes and parsnips and they were delicious! I had no intention of making them but a recipe that started with maple apple sausage ended with an inventive meal that I had no intentions of making. It all started last week when I picked up some maple apple sausage at Lancaster’s Central Market. I was planning to use it for breakfast last weekend but things got busy and breakfast never happened. I was left with maple apple sausage and dinner to make. Initially, my plan was to make regular mashed potatoes and caramelized onions to go with the sausage. I asked Eric to look up a recipe on Epicurious for caramelized onions and he stumbled upon one that included mashed potatoes and parsnips. I had all the ingredients so I changed course and started peeling the parsnips. In the end, everything was delicious and I can’t wait to make this dish again, it also complimented the sausage very nicely. Start the recipe by peeling and chopping up the potatoes and the parsnips. Put them into a medium saucepan and fill with cold water. Bring to a boil and cook for 20-25 minutes until the potatoes and parsnips are fork tender. While the potatoes are cooking, throw the thinly sliced onions into a hot pan, add the brown sugar and salt. Reduce the heat and cook on medium until the onions brown and caramelize. Be sure and stir the onions to prevent sticking and reduce the heat if the onions begin to brown too fast. Add a tablespoon of water if they begin to burn. You want them to cook slowly over the heat; this will take 20-25 minutes. During this part of the process I braised my sausage in chicken broth and then I used that broth to mash up the potatoes and parsnips. Once the potatoes and parsnips are tender, put them in the bowl of a stand mixer and add about a 1/4 cup of the chicken broth. Mix up well and then add more broth if the mixture looks dry. Add salt to taste along with the fresh thyme. Finally, mix in cheese. The recipe calls for blue cheese but I only had gruyere so that’s what I used. When the onions are ready, take them out of the pan and then fry up the rest of the sausage in the pan until brown and crispy. Serve the dish with caramelized onions on top and sliced sausage. Heat oil in a large skillet over high heat; reduce to medium. Cook onions with sugar and salt, stirring occasionally, until onions brown, 20 to 25 minutes. Add a few tablespoons water as you cook to keep onions from sticking or burning. Fill a medium stockpot ¾ full with cold water. Add potatoes and parsnips; bring to a boil over high heat. Reduce heat and simmer until potatoes and parsnips are fork-tender, 20 to 25 minutes, then drain. Beat 1/4 of potato parsnip mixture and 3 ounces broth in a mixing bowl with an electric mixer on medium speed until smooth. Repeat, alternating between potato-parsnip mixture and broth, until you’ve incorporated all. Fold in onions, cheese and thyme, and serve. PS – Bailey is home and doing well! It will be a hard few weeks but she’s already seeming better than ever! I’ve been hiding something from you all and I can’t hide it anymore, I’m “that kind” of dog owner! The kind of dog owner who treats her dog like a child, feeds her special food and gives her extra love anytime she wants it. I NEVER thought I would be this person. I didn’t grow up with any pets except an ant farm and a hermit crab and lets be honest those pets don’t exactly love you back. Dogs were actually a bad subject for me growing up. Somewhere I picked up an intense irrational fear of dogs and anytime I’d see one, no matter if they were 20 feet away or 2 feet away, I’d scream and shake in terror jumping into my parents arms as quickly as possible. Eventually, with age this subsided until I just wasn’t all that fond of dogs with the fear still there a little bit if a dog would jump up at me or try to lick my hand. Then I got married and Eric began asking to get a dog. He had never had one growing up either and always wanted one. Like any newly married woman, I was so happy and in love with him that I agreed and he never forgot. Three years later we bought a house and within 2 months of moving in we started looking for a puppy. We wanted a larger dog that had a gentle personality and both agreed on a Bernese Mountain dog as the breed for us. We saw an ad online and went to see the puppies. We wanted a girl and in this litter there were 5 boys and only 1 girl. As soon as we walked into where the puppies were, tiny baby Bailey came right over to me and started licking my Uggs while all of her brothers couldn’t have cared less that we were there. I was sold, she clearly had good fashion sense and she had picked me! I was a huge adjustment for me to suddenly be a dog owner but with training classes and a lot of patience we ended up raising a sweet, energetic and mostly well behaved dog, life was good. Then, last September we got a phone call from our next door neighbor saying that he had found our Bailey seriously injured laying in our driveway. Eric rushed her to the vet hospital where we were told her leg was splintered beyond repair and were told to choose to either amputate her front leg or have an extensive surgery to rebuild the leg with plates and screws and fuse her bottom joints together. So, being naive, young and having a dog that was only 2 years old, we went for the extensive surgery and took out a line of credit to pay for it all, but our girl got to keep her leg. It was the longest road we could have taken and it took her about 10 months in a splint and then a leg brace to become almost the energetic dog that we knew before the accident. We started walking her daily again and thought we were finally over this hurdle. Until, last month when we noticed a lump on Bailey’s bad leg. She had developed in infection from the plates and screws in her leg and now needed to have them removed to treat the infection. And so, yesterday, we did surgery#2 and she comes home today. Things seemed to go well and the doctor was very pleased. No longer does she have plates and screws holding her bones together, but now her bones are healed and strong and we’re getting rid of the infection. Yesterday, the house was quiet without her and Eric and I were a nervous wreck. Tonight, we’re back on duty as Bailey’s nurses and we’re hoping for a much swifter recovery. If you’re not a pet owner, you might be wondering, “Why would anyone go through all that for a dog? All the money (yes, pet insurance would have been helpful in hindsight), all the time at the vet, all the extra work for a dog?” I used to be one of those people. We could have bought 12 more Bailey’s for the cost of fixing her. But the parts I didn’t expect, are the things that Bailey has taught me and the way she has made my life more fulfilling. I think I’m a softer person after she joined our family, I’m more patient and messes in the house are no longer as big of a deal, but the best part and any dog owner will agree with me on this, is when you come home and no matter how badly she feels or how long she’s been alone she is so happy to see me. That little tail wagging and her attempting to sit in my lap has brightened many of the tough days that Eric and I have had lately. I know that her life will most likely be fairly short compared to ours but she has already left a big impression on our hearts and we love her. So today, I’m thankful for Bailey and for the fact that she will be so happy to see me today even though I’m sure she’s in pain. I can’t wait to give her that squeeze and rub her belly and feed her special sweet potatoes, which she loves, for dinner. Alright Top Chef fans, lets dish (pun intended). What do you think of this season so far? I don’t like that it took 2 episodes just to pick the 16 cheftestants!! Anyone else annoyed by this? I felt like Top Chef’s producers are taking advantage of the fact that Top Chef is such a successful show and now they’re drawing the season out purely in the aim on making more $. The producers made me feel cheap, like they were taking advantage of me. I want to get down to the REAL challenges already. When Chef Tom kicked that guy off before he even got to the stove! He butchered the meat completely wrong and Tom was like, “just go, get out.” Of course before that moment, the cheftestant was all pompous and saying he was amaze-ballz because he was so young and on the show. Hard to say, at this point since we barely saw them. There is a good looking guy… Chris Crary; I’m rooting for him for now, until we see some more cooking. Emeril, I love him. And the other new guy needs to wax his unibrow, seriously. Don’t miss tomorrow night’s episode! This is my favorite recipe for meatballs. It’s a Giada Delaurentis recipe and I’ve been making it for a few years now. Of all the meatball recipes, I prefer the turkey ones. Not only are they healthier for you, but I just think they taste better. I like beef/pork in my bolognese and turkey in my meatballs. I found this recipe in Giada’s Everyday Italian cookbook but it’s also available online at Foodnetwork.com. Giada recommends using dark turkey meat for this recipe and I completely agree with her. Breast or white meat will not bring the flavor that you want for these meatballs. Meatballs need a hearty and rich flavor that white turkey meat just isn’t going to get you. To begin the recipe, combine all the ingredients with the ground turkey in a bowl. I like to use a fork to mix everything up, I find the prongs it the fork promote the meat to mix better with the spices; some people use their hands for this part but I hate that feeling so I prefer not to. Either method will get the job done. Once the meat is well combined, use your hands to form the mixture into small meatballs. Once all the meat has been formed, heat up olive oil in a large pot or deep saute pan. Saute the meatballs until they are nicely browned on all sides. Warning: you kitchen will get smokey and your stove top will be covered in oil splatter. Be prepared. Once the meat balls are cooked, I whip up a quick batch of marinara sauce and throw the meatballs in to simmer for about 15 minutes or so to get the meat flavors through the sauce and to finish cooking any parts of the meatballs that didn’t get cooked during the saute process. Serve over some wide noodles that can pick up the sauce well, I like linguini or fetticini the best. In a large bowl add bread crumbs milk and mix until well combined. Mix in eggs and 1/2 cup Romano cheese and mix well. Add turkey and gently combine, being careful not to overwork the meat. Season with salt and pepper. Shape into golf-size balls. In a large skillet heat the oil over medium high heat. When almost smoking, add meatballs and without moving or turning the meat, allow it to brown for about 3 minutes. Turn meatballs and brown other side. Continue to cook until all sides are golden brown, about 8 minutes total. Add tomato sauce and bring to a boil. Lower heat and allow meatballs to simmer for 5 minutes. Turn off heat and keep warm on stove. Be careful not to overhandle the meatballs since they are soft and fragile. In a large pot, bring to a boil 6 quarts of salted water. Add pasta and cook until al dente, about 8 minutes. Drain pasta in a colander. Do not rinse pasta with water since you want to retain the pasta natural starches so that the sauce will cling to the penne. Remove meatballs from sauce and place in serving bowl. Pour some tomato sauce over meatballs, but leave about 1 cup of sauce in skillet. Place the cooked penne into the skillet with the remaining sauce and toss well. Pour sauced pasta into a large serving bowl. Serve alongside the meatballs. Thanksgiving is coming…The Turkey’s Getting Fat? The turquoise and gold combo here is just beautiful and I love that they’re different from traditional Fall colors. Um yeah, I just love everything in this picture; anyone else want to run home and paint your dining chairs aqua? Any of these tablescapes float your boat? 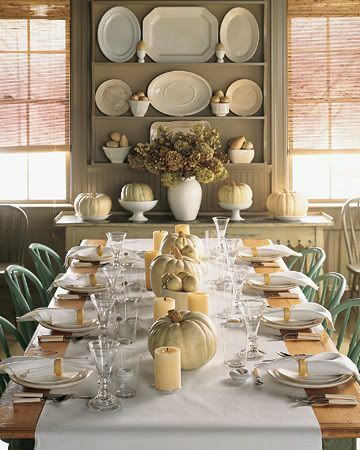 After putting together this post, I’m itching to have a dinner party or my own Thanksgiving-not-on-Thanksgiving dinner. What kind of Fall decor is hanging out in your house right now? I’ve got a pewter bowl filled with some tiny white pumpkin gourd things and a glass vase filled with mixed nuts and another filled with cranberries. Anyone else love white pumpkins as much as me? PS – Anyone see Top Chef Last night? They really are dragging this season out but I’m happy they finally choose the top 16, it only took 2 episodes! Excited for next week when the competition really begins!